We hit our first speed bump over the weekend in the rushed marriage between professional sports and legal sports wagering. And it had nothing to do with gambling. Last month, the New York Jets and MGM Resorts International established a marketing agreement that made the casino company the team’s official gaming partner. The deal includes a non-gambling mobile game, I Called It, built into the Jets’ app. The game is sponsored by MGM. But with these type of deals – several other NFL teams, including the Cowboys, now have agreements with casino companies – comes everyone’s dirty laundry, and we’re not just talking about the Jets’ years of ineptitude on the field. 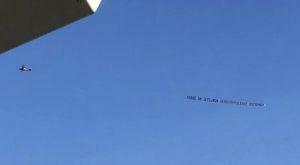 On Sunday, an undisclosed group paid for a plane to tow a banner protesting MGM Resorts over New Jersey’s MetLife Stadium before the Jets/Bills game. The message was an objection to the company’s legal response to the Oct. 1, 2017 shootings in Las Vegas that left 58 people dead and hundreds injured. “SHAME ON JETS/MGM #ENDGUNVIOLENCE #STOPMGM,” the banner read. MGM, to avoid potentially hundreds of millions of dollars in liability claims from victims of the shooting – a gunman, perched in a 32nd floor window of the MGM-owned Mandalay Bay, fired across the Las Vegas Strip at festival grounds also owned by MGM – took legal action last summer to shift blame to the security company that oversaw the targeted country music concert. The company cited a law, created after the Sept. 11, 2001 terrorist attacks, that limits corporate liability in certain tragedies. MGM was roundly and loudly criticized for the move. In July, I wrote that, in the public eye, MGM Resorts had grossly mishandled actions, and that the optics were horrible for the company. According to Yahoo News, federal judges ruled in October against MGM’s effort to centralize 13 lawsuits stemming from the horrific tragedy in Las Vegas. The request came after MGM filed nine lawsuits against more than 1,900 people affected by the shooting. Reports have since surfaced that MGM may be looking at settling the claims with victims. That would be a smart move by the company. “We wholeheartedly agree that our country needs to put an end to gun violence,” MGM Resorts said in a statement provided to the Associated Press Sunday after the plane appeared above the stadium. Mass shootings in the U.S. are far from rare: Marjory Stoneman Douglas High School in Parkland, Florida in February; Tree of Life synagogue in Pittsburgh last month; Borderline Bar and Grill in Thousand Oaks, California just last week. Sadly, there seems to be no end to incidents like these. How we – corporate America, elected leaders, media, sports and entertainment – react is amplified by our social media-driven society. MGM Resorts has accepted its fair share of criticism, but the company also stepped up to the plate in the days following the shootings, which have come to be referred to locally as 1October. The company provided hotel rooms and assistance to family members of the victims, support for first responders, and donated $4 million of the $31.4 million raised by the Las Vegas Victims’ Fund. Since the tragedy, MGM has gone about its business running a gaming conglomerate. In June, it announced a deal with its real estate investment trust affiliate to acquire Empire Casino and Yonkers Raceway in New York for $890 million. The company’s $960 million MGM Springfield opened in Massachusetts in August. Last week, MGM surfaced in a New York Post report regarding a possible merger with rival casino giant Caesars Entertainment. That deal is fraught with federal anti-trust issues – a potential combined company would own 19 Strip-area resorts – and has little chance of happening unless two or three other operators also get involved. MGM has also become one of the leading companies in the new U.S. sports wagering world. In addition to the deal with the Jets, the company has multi-year marketing and data-share partnership agreements with both the National Basketball Association and the National Hockey League, and in July the company entered into a 50-50 joint venture partnership with UK-based GVC Holdings to create a U.S.-based sports wagering and online gambling platform. Right or wrong, though, it looks like much of what MGM Resorts does over the next few years will be somewhat overshadowed by the shooting, how the victims are compensated, and to what degree.